We have a very settled bedtime routine. After his bath my son has half an hour playing with his toys and then a story in his bed before settling down to sleep. However, in spite of this he never seems to go straight to sleep he always calls me 4 or 5 times every evening to go back for one more kiss or a drink or another story and so it can take up to an hour extra every evening before he actually goes to sleep. Although you have created a good bedtime routine it sounds like you have also created a routine of returning to your son 4 or 5 times every night at his request. If you don’t want this to be part of your bedtime ritual you have to make it clear that you are not going to do it. You need to set clear limits and stick to them. It helps to say things like ‘This is the last story, what would you like it to be?’ and ‘Before I go back down do you have everything you need because you know I will not be coming back.’ At first you are bound to have some tears and tantrums but as soon as your son realises that you cannot be persuaded to bring a drink, one more last kiss or read another story he will accept and even appreciate the security that your consistency gives him. I am about to have my first baby and I am keen to help my child develop good habits with regard to sleep from the start. I have friends who have to lay down with their child every evening for ages before they will go to sleep. How can I avoid getting into that situation? The most important thing is that you help your baby develop the capacity to put herself to sleep right from the beginning. This means that as much as possible you should try to put her into her Moses basket or bed while she is still awake. This means that she has the experience of dropping off to sleep unaided. The temptation is to rock her to sleep in your arms, feed her into a soporific state or push her around the block in her pram until she is asleep but then she never has the experience of putting herself to sleep. If you lay her down while she is still awake with a mobile to look at or some soft music playing she will learn to drift off by herself and when habits like this are created from birth they tend to stay with your child as she grows up. My 8 month-old baby still wakes 2 or 3 times in the night to feed. She seems to feed very well during the day but could she still be hungry through the night? If your baby is eating well during the day, as you say, it is unlikely that she needs to feed 2 or 3 times a night at her age. We all have rhythmic sleep patterns, which bring us closer to consciousness at different times during the night. As adults we tend to turn over and go back to sleep and so often we don’t even remember that we woke up. When a young baby wakes at night she needs to learn how to go back to sleep by herself. The problem starts to develop when we respond to her stirrings by giving her some milk and she starts to latch on to this as a method of getting back to sleep. Your best solution is to stop feeding her in the night but now that she has created this habit that is not as simple to do as it is to say. When she wakes you need to go to her to reassure her and then leave. Don’t take her out of her bed. To start with you may need to return many times to reassure her but as long as you don’t give in and feed her, with time and a consistent approach from you, she will start to disengage from the idea that this is a time for food and develop the capacity to settle herself. Gradually she will wake for less time and then you will find that you are not even aware of her waking because she will resettle herself. My baby seems to have swapped night for day, he is awake half of the night and seems to sleep all day. What can I do to turn his clock around? We know that it is natural for us to sleep at night when it is dark and to be awake during the hours when it is light and as adults, this is generally what we do, give or take a few hours. When a baby first comes into this world he has just spent the last nine months in a world where it has been dark, night and day. 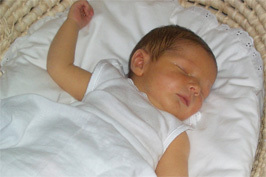 We need to help the small baby adjust his sleep rhythms to be awake when it is light and asleep when it is dark. In order to assist this natural process it is important that we do not make it artificially dark to induce sleep during the day and that we let the child choose his own time to sleep at night. Given the freedom to choose, his biological rhythms will direct him to sleep when it is dark and to be awake when it is light.